Aughlisnafin GAC is a small rural junior club located in the eastern side of the parish of Kilmegan and borders with Dundrum and St John’s. It has been sporadic in it’s existence. The first Aughlisnafin club was first formed back in 1927 and this club quickly developed a Gaelic football team. Frank Lennon played on the team and was also the club secretary. It was with this ‘Fin’ team where Frank won his first GAA trophy in 1928 an East Down runners –up medal. By 1932 a new parish priest by the name of Fr. 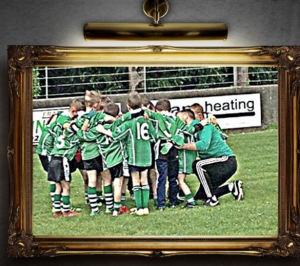 Mc Alea had arrived in the parish of Kilmegan and he was anxious to form a Parish team. He approached the ‘Fin men to join with the Castlewellan O’Rahillys and a new St Malachy’s team was formed in 1933. Along with Frank Lennon came the greats such as John O’Hare, Seamus Lenaghan, Mick McDonald, Hugh McMullan and Hugh McClean (grandfather of current senior player Patrick McClean). The amalgamated Parish team was called St. Malachy’s, and soon became a force. With the ‘Fin men like Frank Lennon and John O’Hare the St Malachy’s team swept the decks. In 1934 St.Malachy’s were the first winners of the Feis 7’s and were represented by five ‘Fin men in Hugh McClean, John O’Hare, Seamus Lenaghan, Frank Lennon and Mick O’Donnell. They defeated Clonduff in the final. The 1934 season was a particularly brilliant one for in addition to winning the league the St Malachy’s team also won the Senior Football Championship, then won it again in 1936. Frank Lennon and John O’Hare, who also starred for the County then returned to Aughlisnafin when the team broke up in 1937. In 1938 they both went on to win their third Feis 7 medals with a newly re-formed Fin team. Frank remained with his native ‘Fin where he gave many more years service before the club folded again while St Malachy’s continued as the current Castlewellan club. In 1966 the impetus for re-forming a team in the Fin gained momentum as a result of Dundrum folding as a club in the early sixties. Michael McKibben, a secretary of the old ‘Fin team, recalls “Frank Lennon along with Owen Mc Geown, Mick Mc Donald, Hugh Mc Clean, Jimmy Walsh, James Mc Clement and Johnny McCartan organised a meeting which was held in the old Fin School and attented by Fr. Bernard Magee who was a curate in the Parish at the time and who is now Canon Magee and is still celebrating mass in the parish. At that meeting it was decided to reform the club”. up and coming young talent in Brendan McKibben who starred for Down in the first round of the Ulster SFC against Antrim in 1970 but who tragically passed away in January 1971. It was while playing for Queen’s and the ‘Fin that he was noticed by Des Farley who was the team coach. Gerry Flanagan was a promising county minor along with Colm McCartan and Kevin Walsh. Between 1967 and 1973 the team had much success winning the Junior and Intermediate leagues and competing in the All County Senior ‘C’ league before being forced to withdraw at the end of 1973 due to emigration and lack of numbers. The Club re-formed again in 2002 when the Aughlisnafin Ladies team was formed and competed in the Junior League. The Ladies managed by Gerry Flanagan went on the win the Junior Championship in 2004. And in that same year a senior mens team was formed and entered the Down All County Division 4 league. Success can be measured in many ways and the survival of a small rural club in the parish of Kilmegan is a success in itself. The Club has not won much in the way of silverware on the field since 2002 with the most notable success being when the Senior Ladies team annexed the Down Junior Championship in 2004. The senior mens team reached the semi finals of the Down Junior Championship twice in the past three seasons. Both times they were defeated by teams who had come down from Division 3 the previous season and both also having played in the Intermediate Championship the season before aswell. In 2015 they narrowly missed out on promotion to Division 2 under the management of former double All Ireland Senior medallist Conor Deegan. The men won the Ballykinlar GAC Connolly Cup in 2016. The underage teams have seen notable success. 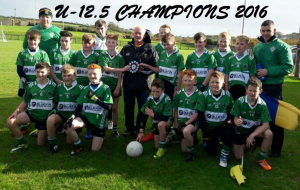 In 2015 the U12’s won their first East Down league title winning the ‘U12C’ Section and the following year 2016 the U12.5’s won the ‘C’ Championship. The U16’s featured in the ‘A’ section in East Down in 2016 for the first time in their history finishing a respectable third out of nine teams. The U16’s were also losing semi finalist in the East Down U16A Championship. The minors have amalgamated for the 2017 season with near neighbours St John’s under the team name ‘Baile An Locha’ (Ballylough) and will compete in the East Down Minor A league and Championship. The crest is in the shape of a cross with a celtic design and shows a green and white ring with a Ring Fort inside (Líos). The Aughlisnafin Road adjoins the Whitefort Road and this is where the ‘as gaeilge’ spelling Achadh Líos Na Finne is derived from, “Place of the White Fort”. The club’s original jersey upon reforming in 2002 was green with a white ring. The senior team and juvenile jerseys still show the white but now as a band on the front of the jersey. The Ladies team jerseys have white sleeves. All in keeping with the club’s original colours. The club plays all its home games on the council owned playing fields in Annsborough.